Telecare is essentially care delivered at a distance through the use of technology. 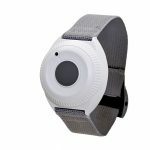 It provides a 24 hour connection between a person in their home and trained CareLink call-handlers at a 24-hour monitoring centre. Basic telecare systems consist of two parts; an emergency panic button which can be worn as a wristband or pendant, and a two-way speech unit usually located in the hallway of your home. 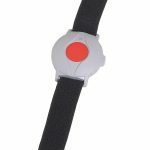 In an emergency situation the alarm button on the wristband or pendant can be pressed for help. 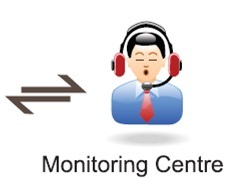 It then immediately connects through the two-way speech unit to CareLink call-handlers in a 24/7 monitoring centre. The trained call-handlers can then arrange for help, if needed. Many other devices can transmit a signal to the two-way speech unit for added 24/7 protection in every room of the home. These pieces of telecare equipment include: automatic fall detectors, smoke detectors, Carbon Monoxide (CO) alarms, and flood detectors. The devices are generally wireless and are therefore easy to install around your home or in outhouses. By providing a 24-hour link to a CareLink monitoring centre, pendant alarms and telecare systems help many people, including the elderly and people with disabilities, to stay independent and safer while at home. In doing so, telecare provides peace of mind for the individual, their family members and loved ones. The ‘What is Telecare‘ animated video below, explains how the simplest form of telecare works (i.e. a pendant alarm button/wristband button). 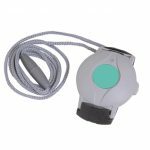 Below it on this page you can find lots of useful additional information about pendant alarms, how telecare works, what to expect in a telecare system and how to buy telecare. The most well known telecare device is the emergency pendant button. Many different styles are available and wristband versions are also popular. Regardless of how they look or how you chose to wear them, the function is the same (i.e. to call through to a 24/7 monitoring centre when help is needed). Why is a two-way speech unit needed? The telecare two-way speech unit (or base-unit) is the part of your telecare system that dials through to a 24/ monitoring centre when the alarm button on your pendant is pressed. It is the central part (or ‘brain’) of your telecare system. 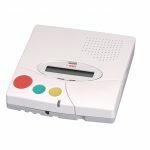 The two-way speech unit is usually located in the hallway or bedroom but can be placed anywhere so long as it is connected to an electrical socket and telephone line. Many different makes/models of base-unit are available and each type will have different functionality. Most alarm units will dial a number of times automatically if the call does not get through. The microphone in the base-unit is quite sensitive so you can be some distance from it and still be heard. Always ensure that your base unit comes with a built in battery backup installed. This will ensure that your alarm will continue to function in the event of a power cut. Most telecare two-way speech units can take in signals from many other telecare devices located around your home. This could include monitored pull-cords, carbon monoxide (CO) detectors, door exit alarms or any number of other telecare devices. When any telecare device in your home is triggered, a radio signal is transmitted to your telecare two-way speech unit. Each different device sends a unique identifying code to the 24/7 monitoring centre. The call-handlers should then know which piece of telecare equipment in your home has been activated. How many telecare devices connect to the two-way speech unit? The number of telecare devices that will connect to your two-way speech unit will depend on the make/model of your telecare unit. Therefore it may be best to check this with your telecare supplier before purchasing any telecare system. Also, some providers subsequently charge for 24/7 monitoring each telecare device separately, so ask about whether or not those potential charges will apply too. What other telecare devices are available? Our Telecare Equipment page lists some of the different telecare devices commonly available. The below SlideShare from TASK Community Care, also gives a useful summary of many of the different telecare devices available which they supply. The listing of telecare products starts at page six. You may need to enlarge it to read the text descriptions for each telecare product. 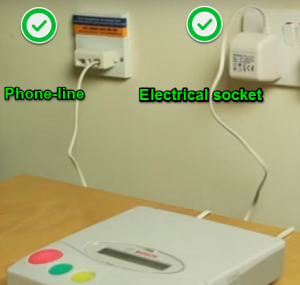 If you have a home phone-line (with no broadband) then the two-way speech unit is usually installed by simply plugging it into (a) a phone-line connection socket in your home, and (b) a standard electrical socket. See our ‘How to Install Telecare Equipment‘ page for further details on installing telecare in your home. Do I need a home phone-line for telecare? If you don’t have a home phone-line, a telecare ‘GSM’ base-unit can be used instead. It is installed in the same way as a standard telecare base-unit but only an electrical socket will be needed. See our ‘How to Install Telecare Equipment‘ page for further details. What happens if I press the emergency pendant button but call-handlers can’t hear me? If CareLink monitoring centre call-handlers do not hear a response (for instance, if you have fallen in your driveway) they will first try calling you back to your home. If they still don’t get a reply, they will then call one of the nominated contacts you have provided details for, such as a neighbour, family member or friend. What happens if I press my pendant alarm button by mistake? Don’t worry if you push your alarm button by mistake. Monitoring centres don’t mind receiving accidental calls. In any case, you should be pressing the alarm button at least one a month to check your telecare system is working. In addition, most base-units have a button you can press to cancel the call from going through. What is the range of a pendant alarm? The range the pendant alarm will work before it stops transmitting to the two-way speech unit is important to know. The range will depend on the type of equipment you purchase. Generally it should span from between 150 to 350 meters. Ask suppliers about this before you buy as it could determine whether your pendant will work in your driveway or garden. Other factors such as the thickness of walls in your home will also have an effect on the range. If you live on a farm or have a large outdoor area you may be able to get ‘repeaters’ added to outhouses (provided they have an electricity supply). Repeaters will add significantly to the distance that can be covered by the pendant transmission. Will my pendant alarm work if there is a power cut? All alarm units that meet the European EN50134 series of standards for Social Alarms, work on mains electricity and will have a battery back-up. Always check this before you buy. The battery back-up will automatically come on if the power is disconnected or if the electricity fails for any reason. Many alarm units give an audible warning to let you know if there has been a power failure. What if my telephone line is not working? 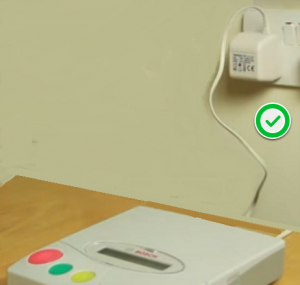 Some alarm units will give an audible alert if the telephone line is not working (or if the unit has been unplugged from the telephone socket). It’s important to identify this right away as emergency calls will not go through to a monitoring centre if your phone-line is down. What do I need to know about 24/7 telecare monitoring? Check out our 24/7 telecare monitoring page for information directly related to the monitoring of your pendant alarm or other telecare equipment. You can buy telecare privately from a number of suppliers. Government grants are also available. Visit our ‘How To Get Telecare‘ page for further details.